Our Fleet Management Software allows you to track vehicle usage, maintenance, mileage and fuel consumption. Add to this the ability to assign and allocate vehicles to drivers, integrate with fuel card and tollway data and perform custom reporting. This provides you with a really powerful management system that ensures fleet optimisation and productivity. At Database By Design we have a comprehensive Fleet Management System which we can further customise to meet your unique business requirements. 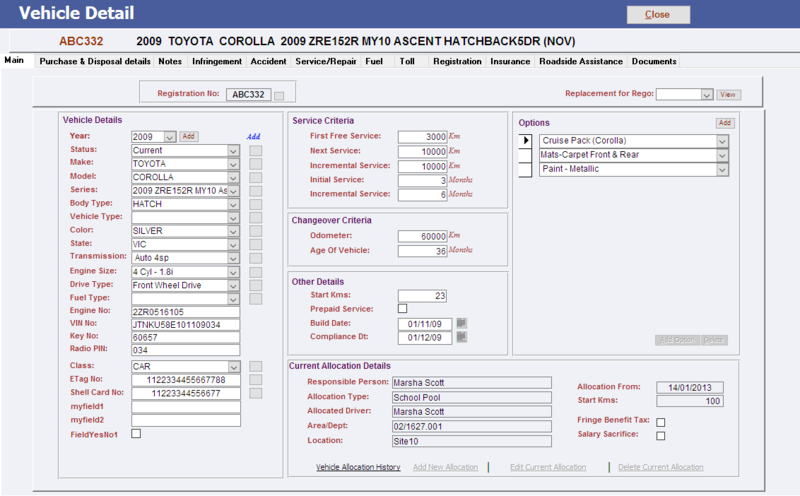 The vehicle search screen provides you with the ability to easily locate a vehicle in your system based on any number of criteria. Once you have found the vehicle you are interested in you can view all information relating to the vehicle in the one location. You can also tie external documents to a vehicle. 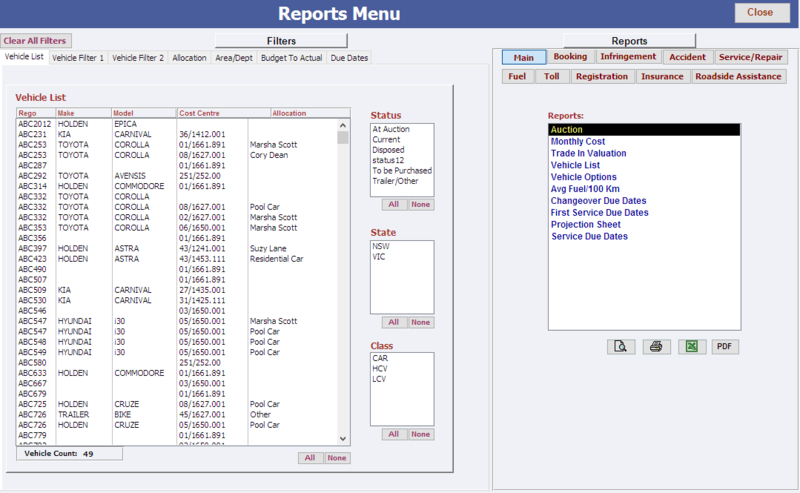 One of the most powerful functions of our system is the ability to generate reports easily with our reports menu. This allows you to easily drill down to the data you're interested in. Your information can then be output in a number of different formats (PDF, Excel etc). Over 30 filters and 25 reports are included this means you have 100's of different combinations and formats in which your data can be viewed. If you are familiar with using Microsoft Access databases, download the database file and place it in a Trusted Location. The installer will check and install any prerequisites. Simply run the Setup.exe and follow the instructions on the Wizard. Note: If you do not have Microsoft Access installed, download the Windows Installer version which automatically installs Microsoft Access 2010 Runtime. Use the username "Admin" and password "Admin" to log in the first time, you will be able to set up new users and customise the demo company as you require. The trial period starts upon opening the program the first time and will expire after 30 days. To avoid interruption of use, please contact us at least 7 days before the trial expiry date to organise an implementation of the full version. Please complete the form below as we would like to send you a friendly follow up email to see how you got on with the trial.